HONG KONG/BEIJING (Reuters) - Canadian retailer Alimentation Couche-Tard Inc and China's Tencent Holdings Ltd <0700.HK> are among suitors short-listed to buy a $16 billion minority stake in China's Sinopec Sales, the world's largest fuel retail network, people familiar with the matter told Reuters. China Life Insurance Co Ltd <601628.SS>, the nation's biggest insurer, Hong Kong-listed ENN Energy Holdings Ltd <2688.HK>, privately-owned Fosun Group, Hopu Investment Management and Affinity Equity Partners have also progressed to the next round, said the people who declined to be identified as the sale process is confidential. Formally known as China Petroleum & Chemical Corp <600028.SS>, state-run Sinopec plans to sell up to 30 percent of Sinopec Sales by end-2014 as Beijing restructures government-owned assets. Sinopec Sales booked a net profit of 25.1 billion yuan ($4.1 billion) in 2013 from over 30,000 service stations and more than 23,000 convenience stores. While a deal would give investors little control over the company, a likely exit through an initial public offering planned within three years has attracted a wide range of suitors, the people said. The company also wants to boost non-fuel sales and is seeking investors to get into businesses such as car services, telematics, online-to-offline sales, financial services and advertising, the sources added. Sinopec Sales generated 1.49 trillion yuan in revenue in 2013, but contribution of non-fuel sales was less than 1 percent of the total. In the United States, for example, non-fuel retail sales accounts for about half the profit for gas stations. Sinopec, ENN, Affinity, Tencent, China Life and Fosun all declined to comment about the bidding process. Couche-Tard CFO Raymond Paré also declined to comment and New Hope and did not reply to emails seeking response. Hopu could not be reached for an immediate comment. Final bids are due by end-August, though it was not clear how many shortlisted bidders are likely to make offers. Couche-Tard and ENN are both bidding solo, as is privately owned Chinese investment company New Hope Group, the people said. Local companies, however, are likely to be given priority as per the government policy to share the "dividend" of China's economic growth, Sinopec chairman Fu Chengyu has said. Financial investors, like Affinity, Hopu and China Life would be interested in Sinopec Sales because of its stable yields, which Barclays estimates between 3-4 percent. Couche-Tard, which operates more than 6,000 convenience stores throughout North America, also runs about 4,200 stores under the Circle K brand in China, Japan, Mexico, Vietnam and other countries. Tencent Holding is China's largest listed Internet company and a successful deal will give it access to Sinopec's fuel payments network. The planned divestment comes at a time when Sinopec's domestic fuel sales growth rate has slowed due to falling demand. Gross margins shrank to 2.3 percent in 2013 from 3.3 percent in 2011 and Barclays said in a report that a $1 fall in fuel margin from the current high level of $15-16 per barrel could lower Sinopec Sales net profit by 16 percent. The sale is expected to generate between $16-20 billion for Sinopec, money which Asia's biggest refiner may use to pay down some of its debt and to reinforce upstream investments. If successful, the sale would mark Asia's second-biggest M&A trade this year, after CITIC Pacific's <0267.HK> $36 billion purchase of its parent CITIC Group's assets. 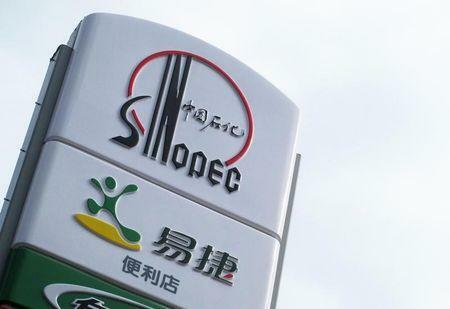 The deal is set to value Sinopec Sales at between $53-66 billion, giving it a price-to-earnings multiple of 13-16.3, according to Reuters calculations. Sinopec unveiled plans in February to restructure the business, which also includes oil-products pipelines and storage facilities across China. Advising Sinopec on the sale are China International Capital Corp, Deutsche Bank , CITIC Securities Ltd <600030.SS> and Bank of America .